The study shows that the LCOE from renewables has decreased rapidly over the last years and has even caught up with the generation costs from conventional power plants. A study from the Fraunhofer Institute for Solar Energy Systems ISE compares the present costs for conversion of different energy forms into electricity and gives a prognosis for the further cost development up to 2030. The scientists in Freiburg analyzed both the levelized cost of electricity (LCOE) from renewables as well as from conventional energy technologies. They present comparative figures for new power plants constructed in Germany, which are based on solar, wind energy and biogas as well as brown coal, hard coal and gas. The study shows that the LCOE from renewables has decreased rapidly over the last years and has even caught up with the generation costs from conventional power plants. Forecasts for Germany indicate that the costs to produce electricity from PV and wind will be less than fossil fuel plants by 2030. The scientists analyzed photovoltaic (PV) systems in Germany at locations with a global horizontal irradiance between 1000 and 1200 kWh/(m²a). Their conclusion is that cost-efficient open field PV plants, installed during 2013 in southern Germany, can achieve LCOE of about 0.08 euro/kWh. Even small roof-installed PV systems in northern Germany produce electricity today for less than 0.14 euro/kWh and therefore lie well below the average electricity price of 0.29 euro/kWh for households. With respect to wind farms, the study shows electricity from onshore wind costs less to produce than from hard coal, combined cycle gas power plants. Today, the LCOE from onshore wind ranges between 0.05 and 0.11 euro/kWh. Offshore wind, on the other hand, has much higher electricity generation costs of 0.12 to 0.19 euro/kWh, despite the fact that it has more full-load operating hours. The offshore wind technology still shows a large potential for cost reductions, whereas onshore wind has nearly reached its limit. Levelized electricity generation costs from biogas, dependent on load and fuel type, range from 0.14 to 0.22 euro/kWh. The study uses the LCOE of new conventional power plants for brown coal, hard coal and natural gas as reference values. Dependent on the number of full load operating hours assumed, of the fuel price and of the price of carbon credits, the levelized cost of electricity from brown coal presently extends up to 0.053 euro/kWh, from hard coal up to 0.080 euro/kWh and from combined cycle gas power plants up to 0.098 euro/kWh respectively. The analysis is extended by an outlook on the LCOE of oil-fired power plants in the Middle East. Under the assumption of oil prices from the world market, oil-fired power plants show generation costs in the range of 0.13 - 0.17 euro/kWh compared to PV with an LCOE of around 0.08 euro/kWh. 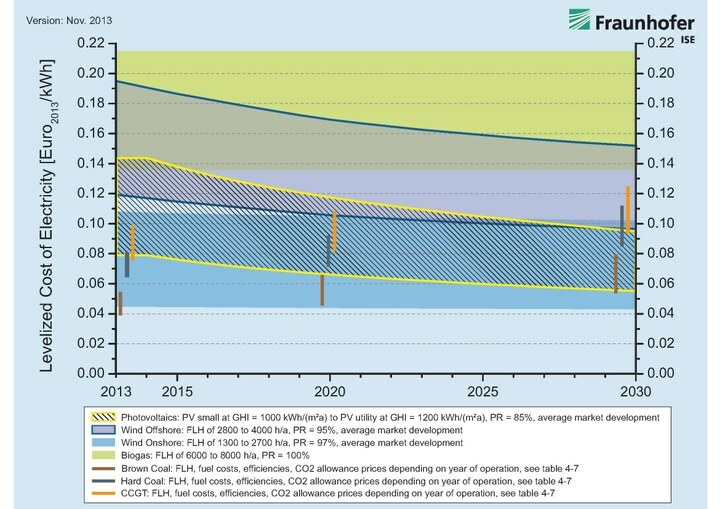 After evaluating and comparing all of the data, the scientists at Fraunhofer ISE present the following outlook: “By 2030 the electricity generation costs from PV will decline down to 0.06 - 0.09 euro/kWh. At this value, even small roof-installed PV systems will be able to compete with onshore wind and also with the higher generation costs in the future from brown coal, hard coal and combined cycle gas power plants,” says Prof. Eicke R. Weber, director of Fraunhofer ISE. Also, onshore wind will experience a decrease in the electricity generation cost, as compared to conventional power plants. At the latest, this technology will be competitive with brown coal in 2020, since with the progressing energy transformation, the number of full load operating hours will decline and the price of the carbon credits could increase. Upon comparing the different renewable technologies, the results of the study show that, in the future, the costs of PV and onshore wind will lie well below 0.10 euro/kWh. Both technologies will clearly win the race towards cost leadership. Although offshore wind has higher costs, it also has more hours at full load operation. The higher costs for biomass systems are balanced by its controllability.